George H.W. Bush, the 41st president of the U.S., rode the last 70 miles of the final journey to his grave by train. Following days of official ceremonies in Washington and Houston, Bush’s casket was loaded aboard a decorated baggage car with plexiglass side doors for the trip from Spring to College Station, Texas. Thousands of Americans lined the tracks on December 6 as the train made its way toward College Station where Bush was buried beside his wife, Barbara, and their daughter Robin, who died of leukemia at age three, at the George H.W. Bush Presidential Library and Museum at Texas A&M University. It would be fun to paint Bush as a railfan, and that’s possible but not probable. It is possible to paint Bush as a man who, in his dealings with Amtrak and freight railroads, followed the physician’s oath: first of all, do no harm. Unlike some other presidents, all Democrats, he did nothing to cut Amtrak service. On his watch, however, major legislation was passed that had a profound effect on the railroad industry. That legislation included the Americans with Disabilities Act of 1990 (ADA) and the Intermodal Surface Transportation Efficiency Act (ISTEA) of 1991. The ADA requires that “public transportation authorities must comply with requirements for accessibility in newly purchased vehicles, make good faith efforts to purchase or lease accessible used buses, remanufacture buses in an accessible manner, and, unless it would result in an undue burden, provide paratransit where they operate fixed-route bus or rail systems.” ISTEA provided authorization for public transportation and highways and gave more power to metropolitan planning organizations. The act was to “develop a national intermodal transportation system that provides the foundation for the nation to compete in the global economy and will move people and goods in an energy-efficient manner.” Numerous bills since then have expanded the powers of ISTEA. The lead locomotive that pulled Bush’s funeral train is a story all by itself. 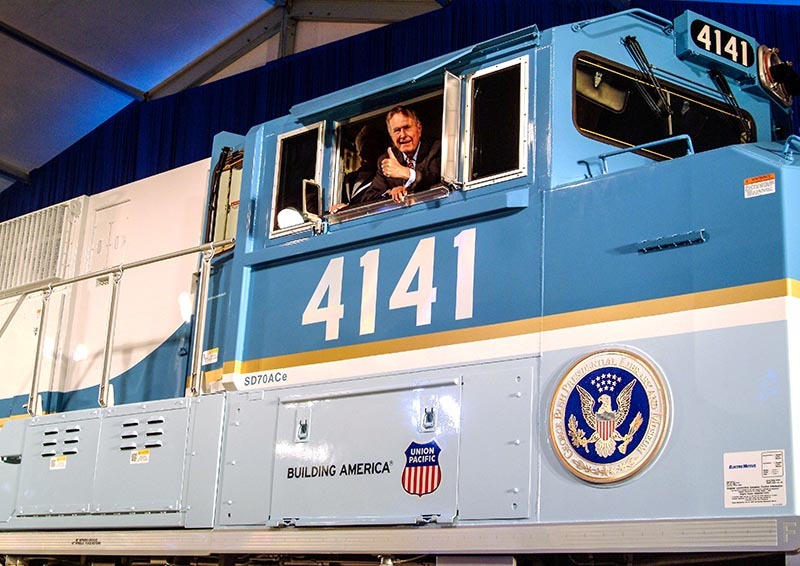 The SD70ACe is numbered 4141, symbolizing that Bush was the country’s 41st president. It is painted in the colors of the presidential jet when Bush was president, and is named for Bush: George Bush 41. It was unveiled on October 18, 2005, at the George H.W. Bush Presidential Library and Museum, where Bush beamed with pride. 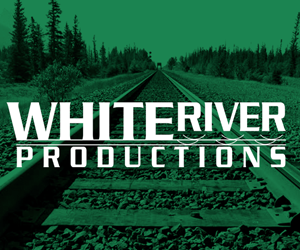 For years, the locomotive operated in freight service all over the UP system. It was temporarily retired and placed in storage for several years, but was periodically serviced to be certain it would be ready for the Bush funeral, whenever that would be. The locomotive was the idea of Union Pacific. Mike Iden, a retired UP general director, told the story of one of Bush’s visits to the locomotive after it was painted. Bush climbed into the cab and asked a lot of questions, Iden said, then suddenly asked if he could run the engine. Immediately, Iden said yes, then gave Bush an education on how to run a locomotive. With an engineer standing behind him, Bush ran the engine for a couple of miles. In his 1992 reelection bid, Bush campaigned from three special trains. The first ran on September 26 from Columbus, Ohio, to southeastern Michigan. I happened to be in Ohio at that time and paced the train for several hours, snapping some photos. On October 20 and 21, a train ran from Atlanta to Spartanburg, S.C., and Raleigh, N.C. On October 31, a train ran from Burlington, Wis., to Waukesha and Chippewa Falls. This may be the last presidential funeral train, although there will probably be more campaign trains. The problem with funeral trains is that there is no campaign organization to pay the bills. Operating special campaign trains is quite expensive, including police at every road crossing and following helicopters, and there must be a lot of crew members for the special and for the sweep train ahead and the following train. However, all those expenses are paid by the campaign. A funeral train does not cost as much as a campaign train, but nonetheless is expensive because of the need for crowd control and possibly a sweep train. All those costs are paid by the railroad. 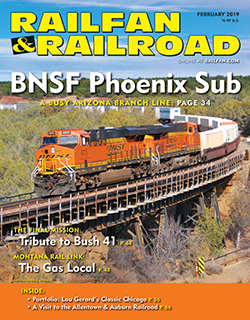 Union Pacific didn’t seem to care, partly because it received a lot of national publicity in newspapers and on network television, and partly because it would be a shame to plan the trip for so long and not use the locomotive. Before the Bush funeral train, Dwight D. Eisenhower was carried on the last funeral train in late March 1969 from Washington to Abilene, Kan. His body rode in an old baggage car because he wanted to ride in the same type of car as soldiers who were returned home in World War II. Franklin D. Roosevelt died in Warm Springs, Ga., on April 12, 1945. His body was hauled to Washington aboard a train pulled by a series of double-headed Southern Railway Ps-4 4-6-2 locomotives. One of those locomotives is now on display in Washington at the Smithsonian Institution. Before Roosevelt, five other presidents were carried on funeral trains including Abraham Lincoln, Ulysses S. Grant, James Garfield, William McKinley, and Warren Harding. Harding, who died in San Francisco, had the longest ride, first to Washington for a state funeral, then to Marion, Ohio, for burial. Why was Bush so well liked at the time of his death? Part of the reason is that presidential politics has changed since Bush was president. The presidents who came after him are a different sort who, among other things, had sexual escapades and/or were not so naturally honest. Bush was firmly married to one woman for the majority of his life and was nice to reporters even when they asked tough questions. It isn’t just the question of being well-liked, but also the fact that presidential historians call him one of the most effective presidents ever. They give him credit for the end of the Cold War and for walking a tightrope that led to the end of the Soviet Union. With one wrong step, Bush could have revived and strengthened the Soviets. Bush, actually, was a little confused to be given such credit. It didn’t seem like a tightrope to him, just his natural inclination to see both sides of a question.